A traveler who asks 10 people what they like to do in Moscow is likely to get 20 different answers. The city is full of interesting spots that aren’t in any guidebooks – and many of them are an affordable way to spend an afternoon in one of the world’s most expensive cities. Communism and video games are two words not often associated with each other, but at this museum, the games speak for themselves. There are numerous games, some more like typical video games while others are more hands-on, such as shooting ranges and pinball. 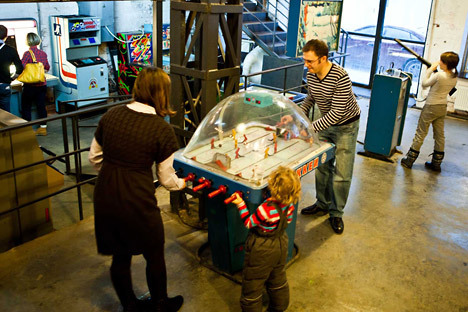 Visitors can buy tokens and try out the games themselves. The place has a certain magical feel about it; many visitors are people in their 30s and 40s who want to introduce their children to the games of their childhood. Everyone has played Mortal Kombat in an arcade, but how many can claim to have gone 10 for 10 at Sea Battle? Visit this museum and join the gaming elite! Did you know the Russian capital had a monorail? This elevated train that runs through northern Moscow’s Ostankinsky District is a great way to see the city for less than a dollar. Among the sites visible from the train is the massive Ostankino TV tower, which still sends out broadcast signals across Moscow. The monorail ends at Sergei Eisenstein Street, just north of the famous monument of the Worker and Collective Farm Woman. Not far from here is the All-Russian Exhibition Center, also known by the acronym VVTs. This complex, originally known as VDNKh, was built during the Soviet era to showcase the triumphs of various spheres of the economy as well as highlight the accomplishments of various Soviet republics. Today the place is kind of a combination of theme park and shopping center. But it is an interesting one. Some of the regional buildings still sell unique products from those regions. There are also carnival rides, a museum of the ice age, and a butterfly house. Entrance to the complex is free, although some of the attractions charge a small fee. What would a trip to Russia be without a visit to the vodka museum? Besides offering vodka tastings, this museum features exhibits on the history of the beverage. While Moscow is full of Italian restaurants and sushi bars, the Russian capital also offers cuisines unavailable in many other parts of the world. If there is one reason to try Georgian food, it’s the cheese-filled pastry known as hachapuri. But while this may be the most popular Georgian dish, it is far from the only tasty one. For appetizers, try lobio (slow-cooked beans), satsivi (chicken with walnuts) or nigvziani badrijani (eggplant). Continue your feast with grilled meat accompanied by a range of sauces. Although the rice pilaf called plov may be considered a Russian dish by foreigners, it is of Central Asian origin. Made usually with rice, vegetables and cuts of lamb, it’s a filling meal. For starters, try manti, big fat filled dumplings, available by themselves or in broth. Some of the best plov can be found at the Izmailovo vernisage souvenir market. For something more upscale, try Vostochnoy Kvartal at the beginning of the Arbat.